Iris is one of our original three foundation mares. 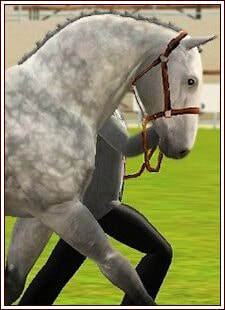 A lovely dapple grey mare, Iris has a beautiful, reaching stride. Big, 9" bone and lovely big body. Iris has been a challenge; but also a joy. She is a sensitive mare and likes to take things slow and simple until she figures out what you're asking. Once she understands, she's good as gold and will consistently perform above expectations. Under saddle, Iris demands an experienced rider. In addition to her sensitivity, Iris is also quite forward. We originally expected Iris to excel as a Jumper, but based on results from local shows, she is proving to excel as an Eventer.